This ADA approved, barrier free acrylic shower base with a right hand drain and bulit in accessibility ramp by Valley Acrylic is made of the highest quality high gloss acrylic. It is also the perfect option for anyone with mobility issues of any kind. All of Valley Acrylic's Signature Series products are manufactured in Mission, British Columbia, hence guaranteeing that these products are 100% made in Canada, and meets the excellent quality standards that are required by Canadian companies. Acritec's Barrier Free Acrylic Retro-Fit shower base is specially designed to replace a standard bathtub during a bathroom renovation. The base features a minimal threshold to allow for easy access into and out of the shower, as well as an offset drain that is designed to closely match with the plumbing from an existing bathtub. This helps minimize adjustments to plumbing during a renovation. The retro-fit base is made of high-gloss, solid cast acrylic. It is supported with a fibreglass backing and has several supports to allow for easy levelling and installation. This base is specifically made to replace most standard bathtubs and the featured offset drain helps to minimize any plumbing adjustments. Available in store by Special Order Only. See associate for details. Acri-tec's Acrylic Retro-Fit shower base is specially designed to replace a standard bathtub during a bathroom renovation. The base features an offset drain that is designed to closely match with the plumbing from an existing bathtub. This helps minimize adjustments to plumbing during a renovation. This base is also ideal for those who prefer not to stand on a drain while showering. The retro-fit base is made of high-gloss, solid cast acrylic. It is supported with a fibreglass backing and has several supports to allow for easy levelling and installation. This base is specifically made to replace most standard bathtubs and the featured offset drain helps to minimize any plumbing adjustments. As part of Acri-tec's Low Profile Collection, this base features modern styling with sharp angles and minimalist features. Available in store by Special Order Only. See associate for details. Give your shower a clean, modern update with the 48" Acrylic Shower Base from Glacier Bay. Made of durable high gloss white acrylic, our shower bases are easy to clean and naturally resistant to stains & scratches. A low threshold base and anti-slip surface with a fully reinforced bottom make it the perfect choice for every day use. The right concealed drain comes with a removable cover for a sleek look. 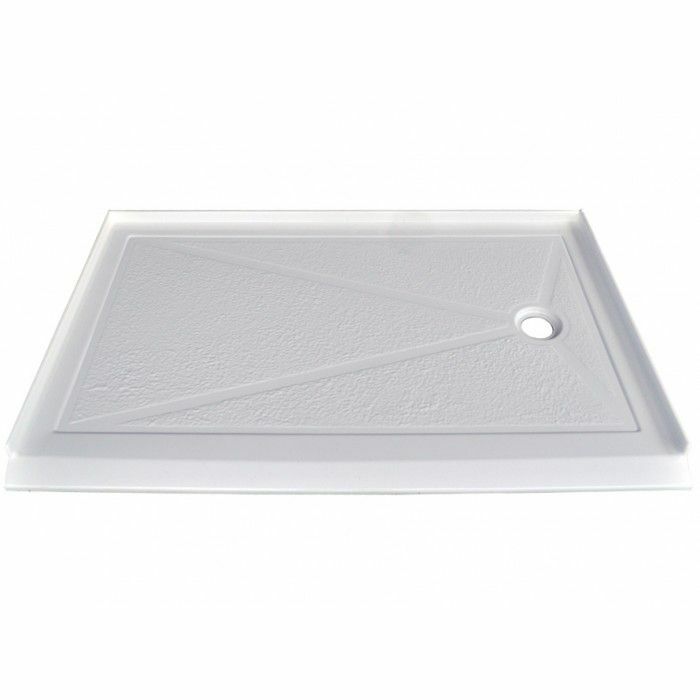 The self-levelling design makes the Glacier Bay shower bases easy to install in any remodelling project. Drain not included. Ellis Acrylic Shower Bases are available in 5 convenient sizes and are ideal for any bathroom configuration. Ellis Shower Bases feature low 4 threshold for easy entry. Purchase the coordinating wall set to create a fully enclosed Acrylic shower stall. Shower only, accessories and waste and overflow not included. Left or right is determined by plumbing. Serene 60X36 Right drain Barrier free Shower base This ADA approved, barrier free acrylic shower base with a right hand drain and bulit in accessibility ramp by Valley Acrylic is made of the highest quality high gloss acrylic. It is also the perfect option for anyone with mobility issues of any kind. All of Valley Acrylic's Signature Series products are manufactured in Mission, British Columbia, hence guaranteeing that these products are 100% made in Canada, and meets the excellent quality standards that are required by Canadian companies.